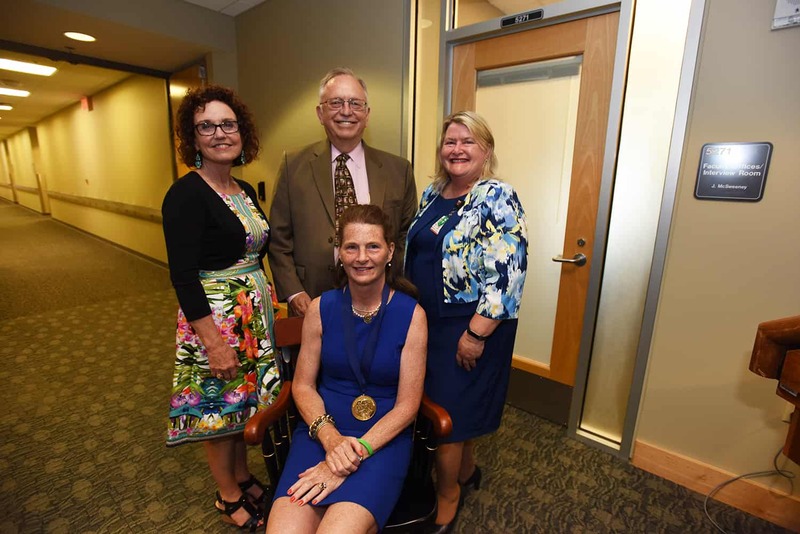 Claudia Barone (front center), D.N.P., Ed.D., was invested June 13 in the Nicholas P. Lang (back center), M.D., and Helen F. Lang (back left), R.N., Endowed Chair by UAMS College of Nursing Dean Patricia A. Cowan (back right), Ph.D, R.N. June 15, 2017 | June 15, 2017 | Claudia Barone, D.N.P., Ed.D, a professor in the University of Arkansas for Medical Sciences (UAMS) College of Nursing, was invested June 13 in the Nicholas P. Lang, M.D., and Helen F. Lang, R.N., Endowed Chair. 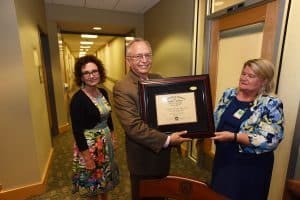 Barone, a nationally known expert in tobacco cessation and a leader in academic nursing, was first invested in 2015 as the inaugural holder of the Lang Professorship. The professorship was elevated to an endowed chair through additional gifts from the Langs and others. The chair will support Barone’s continued work in tobacco cessation. An endowed chair is established with gifts totaling at least $1 million, and it is one of the highest academic honors a university can bestow on a faculty member. The endowed chair provides funding in perpetuity to support the educational, research and clinical activities of the chair holder. Those named to a chair are among the most highly regarded scientists, physicians and professors in their fields of expertise. Barone with her husband, Gary W. Barone, M.D., chief of the UAMS Division of Transplantation, and Dean Cowan. 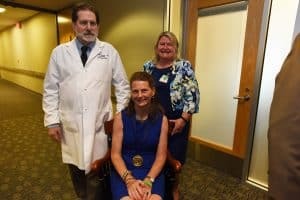 The chair is named for Nicholas P. Lang, M.D., former chief medical officer for the UAMS Medical Center, and his wife, Helen F. Lang, R.N., a longtime nurse in the Central Arkansas Veterans Healthcare System. Barone was presented with a commemorative medallion by Cowan. “This chair will allow me to explore some of the challenges in smoking cessation that we’ve identified over the last seven years,” said Barone. She is widely known for her work in tobacco cessation and has received several grants in the area, and she is working with an interprofessional group of health care providers on tobacco cessation and control. Barone is a certified tobacco treatment specialist through the University of Massachusetts Medical School’s Center for Tobacco Treatment Research and Training. Barone was an appointed member of the U.S. Department of Health and Human Services’ Tobacco Products Scientific Advisory Committee from 2014-2015 and the Association for the Treatment of Tobacco Use and Dependence from 2013-2016. Barone served on the Arkansas Tobacco Prevention and Cessation Advisory Committee from 2008 to 2015 and was vice chairperson from 2013-2015. She earned her Bachelor of Science in Nursing in 1983 at Russell Sage College in Troy, New York, and her Master of Science in Nursing in 1988 at the University of Virginia in Charlottesville, Virginia. She completed her Doctor of Education in 1996 at the University of Arkansas at Little Rock and her Doctor of Nursing Practice in May at UAMS. Barone is a former dean of the College of Nursing, serving in the role from 2006-2011. Barone is now a tenured professor in the College of Nursing and an advanced practice partner in the UAMS Center for Nursing Excellence. She came to UAMS in 1988 as a clinical nurse specialist in the UAMS Medical Center’s surgical division. In 1991, she became a clinical instructor in the College of Nursing. In 2002, she was named interim associate dean for the master’s program and served from 2003 to 2006 as associate dean for academic administration. The Langs received the College of Nursing Dean’s Award during the investiture ceremony. The award recognizes individuals who have contributed to the growth of the College of Nursing. Nicholas and Helen Lang are presented with the Dean’s Award by Cowan. Nicholas and Helen Lang retired in 2014, but their health care careers crossed four decades before that. They met in 1977 in an operating room at the Veterans Administration hospital in Little Rock. They married two years later. Nicholas Lang earned his medical degree at UAMS in 1973 and completed his residency at UAMS and the John L. McClellan Memorial Veterans Hospital in Little Rock. He completed a fellowship at the Laboratory of Immunodiagnosis at the National Cancer Institute in Bethesda, Maryland. He joined the UAMS College of Medicine in 1990 as a professor in the departments of Surgery, Radiology, and Physiology and Biophysics. He served as chief of staff at the Central Arkansas Veterans Healthcare System from 2001-2007. In 2007, he became chief medical officer for UAMS Medical Center and continued in that position until his retirement. Helen Lang earned an associate degree in nursing from the University of Arkansas at Little Rock in 1975 and worked at various hospitals in the Little Rock area and at a VA hospital in Washington, D.C. 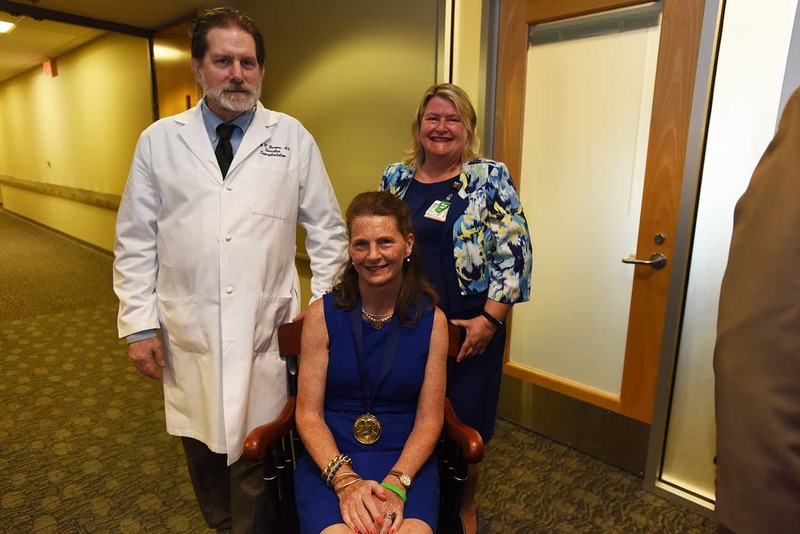 In 1980, she returned to the John L. McClellan Memorial Veterans Hospital in Little Rock and worked as a surgical nurse in general surgery, cardiovascular surgery, surgical endoscopy and urology until her retirement. In 2009, Nicholas Lang honored his wife with a gift to establish the Helen F. Lang, R.N., Scholarship in the UAMS College of Nursing. In 2014, it reached full endowment.